Lambsquarter (American spelling) or Lamb’s quarter (British spelling) - Chenopodium album – has many names beyond the spelling variations: fat hen (because it is used for fattening poultry), goosefoot (because of the shape of the leaves), pigweed or baconweed (applying to any type of weeds fed to pigs), mealweed (referring to the dusty or powdery coating on the surface of the leaves) and wild spinach (lambsquarter and spinach are both members of the Amaranth family). It is also called frost blight and muckweed for reasons unknown. There are just about as many opinions regarding this hearty weed as there are names. Some people think it is just about the most wonderful plant there is and intentionally reserve a patch of their yard or garden just for lambsquarter. As a very early spring green lambsquarter can be harvested and eaten before it is time to even plant most vegetables. This early availability is nice now, but it was especially important in the days before grocery stores and the availability of greens all year long. 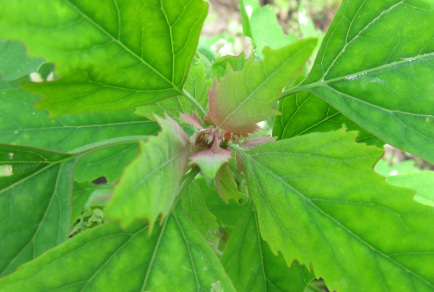 There are many related plants in the Chenopodium family which have been used for food for centuries. The Eastern Woodland Indians grew one variety of lambsquarter as a farm crop and archaeologists found that the Blackfoot tribe of the western United States stored the seeds for later use. In Mexico related species are grown as commercial cultivars -- some for the flowers, some for the seeds and some as leafy greens. Lambsquarter is a rapidly growing annual which can be more than six feet tall or it may mature at a few inches depending on the fertility of the soil, but the average height is three feet. Like many other wild greens, lambsquarter is packed with nutrition. A 3.5 ounce serving of lambsquarter has 232% of the daily requirement of vitamin A (based on a 2000 calorie diet), 31% of calcium and 7% iron. Some organic farmers use lambsquarter as a companion plant in their gardens because they believe lambsquarter attracts leaf miners, Japanese beetles and aphids away from the more desirable plants. On the other hand, some gardeners argue that the presence of lambsquarter actually attracts these insects to the garden and causes crop loss. They insist the lambsquarter should be removed to reduce availability as a food source for insects. Removing lambsquarter can be a challenge, however. They are remarkably adaptable and can grow in all types of soil and at many pH levels. It is found throughout the world -- everywhere except extreme desert climates, from sea level to as high as 11,000 feet. It is one of the last weeds to be killed by frost. 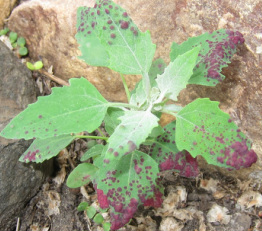 Besides its ability to survive many different conditions, all varieties of Chenopodium are very prolific. A single plant may produce up to 100,000 seeds. The seeds may germinate quickly without any dormancy period or they may lay dormant in the soil for years and germinate when the soil is disturbed. That means that hoeing or tilling a lambsquarter patch can actually increase the number of plants by exposing more of the seeds. The best way to eradicate the weed is to continually remove the plants before they go to seed, year after year. The good news is that most seeds are deposited near the mother plant, so most plants tend to grow in patches. The first leaves to sprout are rounded and opposite each other. Later leaves are arranged alternately on an erect stem and are triangular with a slightly toothed edge. 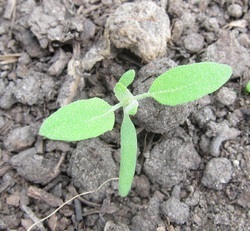 One of the most unique features of lambsquarter is that the leaves are coated with a white, powdery substance. It is harmless and rinses off easily, floating to the surface of the water when the weeds are submerged. Early leaves from smaller plants are the most tender but larger leaves are fine when cooked. Continual harvesting from the plants with keep a supply on new tender leaves which can be harvested until the frost in the fall. Lambsquarter is very similar to spinach and can be eaten any way spinach might be served -- in salads, sandwiches, soups, casseroles, dips, eggs and quiches or just cooked and served with butter and salt. The leaves can also be dried and ground into a flour to make tortillas. Some people also collect the seeds in the fall and either grind them to make a flour, cook them as a cereal or germinate to use as sprouts in salads and sandwiches . The seeds can also used as a seasoning, bird seed or even as a substitute for coffee. Another common feature is the presence of purple dots that sometimes color the leaves. Like the mealy powder, the purple coloring is benign. The flower heads from lambsquarter can even be used as a broccoli substitute. On the other hand, lambsquarter, like spinach, sorrel and rhubarb, contains oxalic acid and will interfere with the absorption of calcium. People who are prone to kidney stones may need to limit their intake of these foods raw. When cooked, oxalic acid breaks down and doesn't pose a problem and shouldn’t affect people who are not susceptible to kidney stones, but it might still be wise to eat these foods in moderation. If you plan to eat a lot of raw lambsquarter in salads or smoothies, use lemon juice to neutralize the oxalic acid. Suggested ways to eat lambs quarter: Sauté a little garlic, onions and nuts in olive oil with lambsquarter, salt and pepper. Unlike some greens (such as sorrel) that turn olive or brownish green, lambs quarter is actually a pretty, almost kelly green when cooked. Use leftover cooked lambsquarter with mozzarella cheese to make a quesadilla. Don't let the color put you off. If you like guacamole you will most probably like this spread. Process all ingredients together in a food processor or blender. 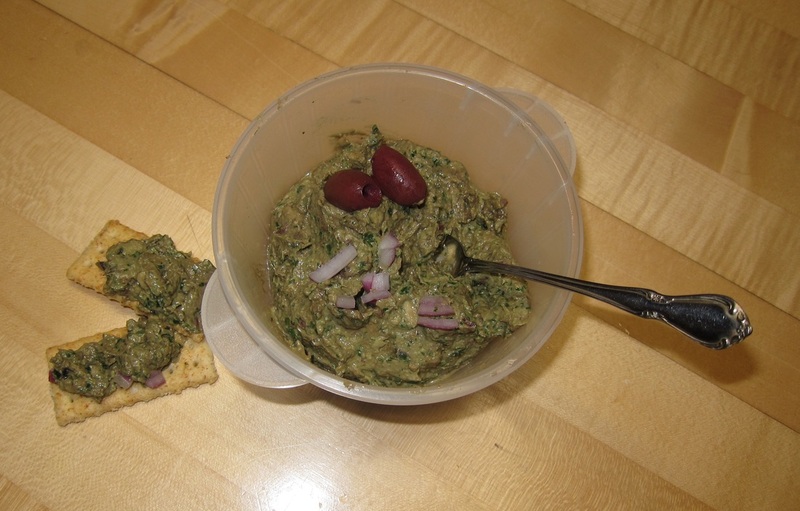 Serve with pita chips or as a sandwich spread. Blend together until smooth. Serves two. This makes a very pretty green smoothie. The pears make it sweet and the almond extract makes it taste good. However, if you like mint, I'd suggest substituting mint extract for the almond just because of the color. The mint makes a really cool, refreshing smoothie! Wash the lambsquarter and cook in salted boiling water for two minutes. Drain thoroughly, pressing out as much water as possible. Chop finely and set aside. Melt the butter in a sauté pan over medium-high heat. Add the onion and garlic and cook, stirring, until soft and translucent, about two minutes. Add the flour, stirring to form a paste. Slowly add the milk and cream and cook until thickened. Add salt, pepper, nutmeg and Parmesan cheese, stirring to combine. Add the lambsquarter; cook and stir until the lambsquarter is reheated and assimilated. Personal notes: It looked rather pale so I sprinkled a little extra Parmesan cheese on top and broiled it to brown it. Also, I would leave out the nutmeg if I made it again. It just didn't do anything for me.